Citizen is pleased to announce its partnership with Billie Jean King, former number world number one professional tennis player, who is well known for her advocacies for gender equality and social justice. A 2009 recipient of the Presidential Medal of Freedom and named one of the “100 Most Important Americans of the 20th Century” by Life Magazine, Billie Jean King represents the many values of Citizen watches in time for the brand’s 25th Anniversary as the Official Timekeeper of the U.S. Open Tennis Championships. Billie Jean King defeated former men’s tennis player, Bobby Riggs, in the renowned “Battle of the Sexes” tennis match, marking one of the greatest moments in sports history. The match was one of the most watched televised sports events of all time, with her victory becoming a staple in public acceptance of women’s tennis and the overall women’s movement. Since then King, founder of the Women’s Tennis Association, the Women's Sports Foundation, and co-founder of World Team Tennis, has never stopped advocating for equal rights and has successfully advanced the lives of men and women and boys and girls through sports. 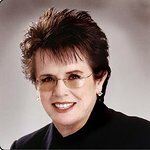 King’s accomplishments were acknowledged in 2006 by the United States Tennis Association when the organization renamed the home of the U.S. Open the USTA Billie Jean King National Tennis Center. Citizen’s involvement with King and the Billie Jean King Leadership Initiative, a non-profit organization addressing critical social issues brings to fruition the brand’s partnership with the world of tennis and its efforts in engaging younger generations. The brand’s previous involvement in the S.H.E. Summit, a personal and professional platform invested in gender equality along with the brand’s National Merit Scholarship initiative achieve similar accomplishments in empowering young adults to understand the heritage of equal rights and to become advocacies for such issues. Citizen is also the exclusive timepiece sponsor for the upcoming feature film Battle of the Sexes, starring Emma Stone as Billie Jean King and Steve Carell as Bobby Riggs, depicting the amazing story that highlighted King’s national victory. During the U.S. Open and throughout the film’s release, Citizen will create promotional activations around the film, Billie Jean King, the Billie Jean King Leadership Initiative, and a special panel discussion starring Billie Jean King, select cast members and other notable personalities. The film is set to open in theaters September 22, 2017.